We invited (mostly retired) Dr. James Tew to the podcast to share with us some of his beekeeping experiences and observations. Jim brings an insightful and sometimes humorous perspective from how he got into bees... and how a bee once got into him! Jim has retired from the Ohio State University Ag Extension in Wooster, Ohio and still lives and cares for his own bees in the area. 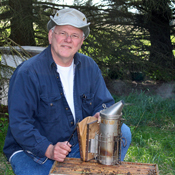 Jim has several books on beekeeping available on Amazon, can be seen regularly on Bee Culture's Kim and Jim Show, and monthly in Bee Culture.